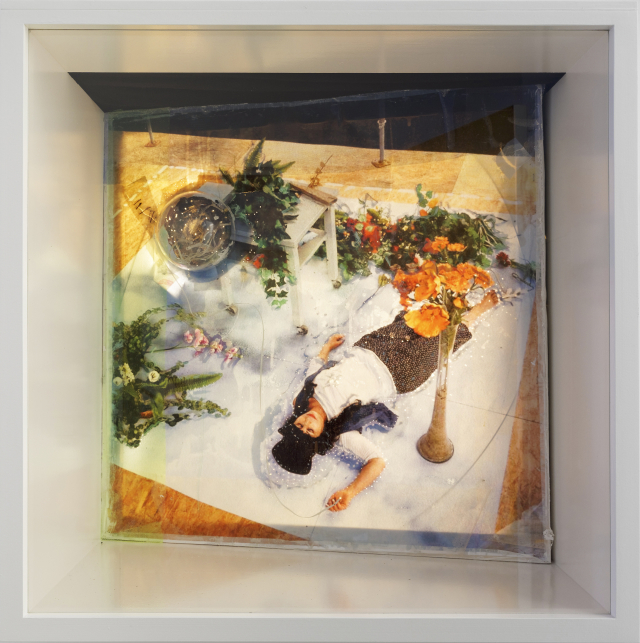 Neumeister Bar-Am is honoured to host Colette Lumiere in their project space Der Würfel where she has installed a new site specific hand-made light box comprising, paint and mixed media and an image from a 2015 installation. Described as a “visionary presence on the New York art scene since the early 1970’s” Colette is known for her unique approach to different media and disciplines, her pioneering work in performance art, street art, the constructed photograph, and for creating elaborate ruched silk living environments in which she often appears as a central element. The energy expressed by Colette throughout her work and life is in keeping with the founding ethos of Der Würfel as a space for experimentation and “thinking outside the box”. Capturing the spirit of a dream-as-reality is at the core of Colette’s practice. The image for Der Würfel includes Colette sleeping within a constructed garden resembling a stage set. Recurring motifs tracing back to her early street paintings and room environments where she often staged herself “sleeping” reappear in this work. Early examples are the “Sleeping Gypsy” after Henri Rousseau, in 1973 and “Sleeping on a Carl Andre” in 1976. Colette was born in Tunis, Tunisia, and grep up in Nice, France, however lived most her life in New York City. In 2015 she was awarded a residency by The Lowen Palais (Foundation Starke) Berlin, and has been spending most of her time here while travelling back to NYC. Colette’s work has been exhibited in, or is in the collection of major museums such MoMA, The Whitney, Guggenheim, The New Museum, PS1, LA MoCA, Musée d’Art Moderne, Paris, the Ludwig Museum, Cologne and others.